It rained that night in Hondo, TX. I watched my ceiling and cabinets for leaks and prayed with fingers and toes crossed. Having been through several RV techs, I haven’t had the best of luck with them. The RV stayed dry. Finally! 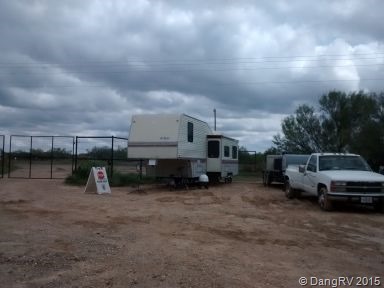 I have indeed found a good RV tech in Texas Country RV in Canyon Lake, TX. The slide was working fine too. While he was at it, he also trimmed the awning that we had replaced over the slide so it rolls up better. The next morning, in the rain, I left to go to my new gate near Big Wells and Valley Wells. It rained the whole way and the back roads were slippery. I had to drive at half the normal speed which made me late. I got to to the gate and setup. I liked it because my pad was right next to the gate for an easy walk and it was next to a paved road. I was really excited about getting back to work. I whacked all the weeds down and threaded my solar lights through the fences to light it up at night and make it easier for workers to find. When I got a chance, I drove down to the rig pads to make a map so I could give out directions. I had some trouble getting my satellite dish to work again and finally moved it up to the roof to get signal above the trees. That night the local cows came calling. 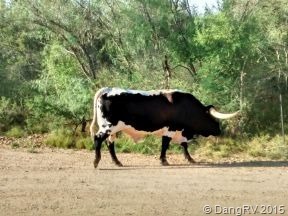 We are talking large Texas longhorns. 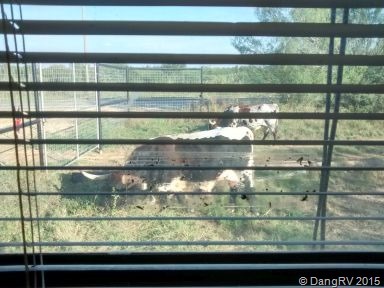 They brushed against my trailer and came right between my door and the fence just 4 feet away. I was very glad my dish was on the roof. The cows came around every evening. 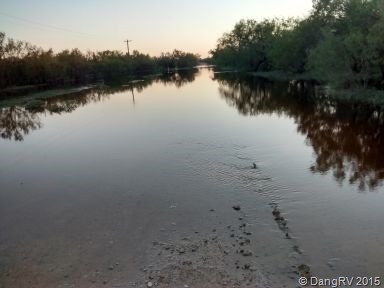 After just a couple days, I got word that the road to the pad was flooding. It wasn’t raining nearby but we were flooding. As usual, the guys kept going through it to work and were tearing up the road. Finally, it got so deep that a tanker went off the road and all work stopped. They got it out and left. Some came back with loads of rock after the water went down to try and fix the road. Others tried to get their equipment out but couldn’t. After being there for a week and a half, they closed the gate and released me.